The websites we build incorporate latest social technologies combined with the highly functional user experience that forge more concrete connections between site visitors and the business. The key methodology behind the success of Web Studios is in combining customer and component-based development. This system provides our clients with highly-reliable, fully tested, yet cost-efficient solutions customized for the unique logic and needs of each website to ensure future scalability. 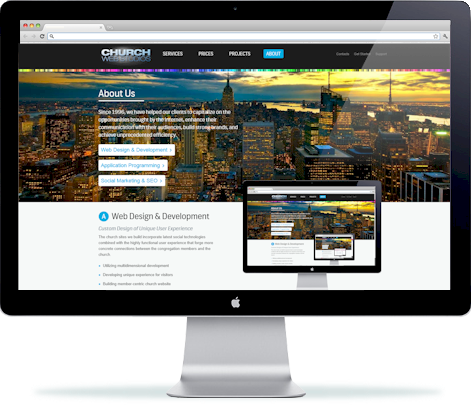 Web Studios developers have 23 years of experience in developing of a custom web-based applications. We assign multiple designers, programmers, marketing specialists coordinated by project managers from within Web Studios to work together with our client's team, which can vary from one to up to a dozen people. SEO still dominates for marketers, with both B2B (57%) and B2C (41%) businesses stating it makes the biggest impact on their lead generation goals. 43% of all online consumers are social media fans or followers through the social media sites.